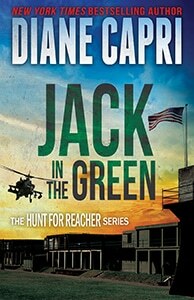 Here on Diane Capri Reveals, we’ve featured some of the biggest names in our genre, including my friends and colleagues Lee Child, the father of Rambo, David Morrell, my colleague at the Bar, Steve Berry, the dynamite writing duos Maxine Paetro (and James Patterson), Grant Blackwood (and James Rollins), and more. You can check out those posts by clicking HERE. For the next few weeks, by popular demand and as a service to our readers, we’re introducing Licensed to Thrill readers to new authors and new voices in this continuing series because the marketplace is crowded and finding good new authors is more confusing than it needs to be. So check out our entire series and see whether you’ve missed a few authors and books you’d like to sample for yourself or gifts for your favorite readers. No mystery/suspense/thriller fan alive has failed to read Daphne DuMaurier’s Rebecca at least once. Most of us have also seen the classic movie directed by the master, Alfred Hitchcock, and staring Laurence Olivier and Joan Fontaine. Most of us have done both — several times. The marriages featured in Rebecca were, not only tense but quite unusual. Why bring this up now? Because today, it’s my pleasure to feature the dynamic writing duo husband and wife team Alicia and Roy Street who are recipients of the Daphne du Maurier Award for Excellence in Mystery/Suspense. This, too, is an unusual marriage, albeit in a completely different way. 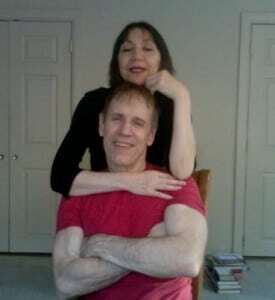 Not only do they write together without haunting each other, Alicia and Roy Street share backgrounds in the performing arts and spent many gypsy years living and working in the different neighborhoods of New York City and Philadelphia. Alicia as a dancer, choreographer and teacher; Roy in theater, visual arts and standup comedy. These two are delightful entertainers, to be sure. Why bring this up now? Read on and you’ll see the relevance right away! Diane Capri: Are you two competing on TV’s Dancing With The Stars? Alicia and Roy Street: *laughs* In a way, we are! Our Dance ‘n’ Luv contemporary romance series shines a spotlight on women of the dance world. Not just the stars, but unsung heroines, the dilemmas they face and the men who capture their passions. Our stories take place in the North Fork, a rural part of New York on Long Island’s windswept eastern tip with its quiet farming hamlets, vineyards and fishing villages. Diane Capri: How many books are there in the series so far? Three? Alicia and Roy Street: Yes. 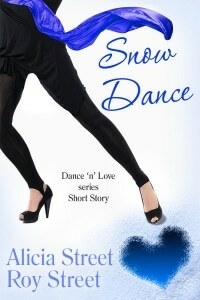 Kiss Me Dancer, Touch Me and Tango, and Snow Dance, the short story which is a prequel to the two novels. They can all be read as stand-alones. We’ve done a ballroom dancer, an ex-Broadway dancer, a dance teacher with a youth group that performs hip-hop, and our latest has a ballerina protagonist. We’re working on the third novel in the series, Stars, Love and Pirouettes. Our projected release date is November 20! Yikes! 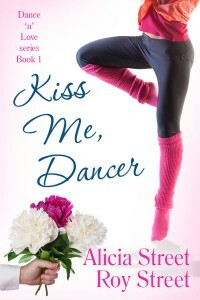 While the books feature dance, they are of course about the lives and relationships of the characters. Diane Capri: What is the hardest part of writing your books? Practicing the choreography? Roy: The first ten pages. They are a bugger. But once we cross that line, the book starts to write itself. While we often leave the beginning in a raw stage, knowing we will go back and fix it, if it’s too rough around the edges I feel like we’re sailing in a leaky boat. Alicia: My biggest problem is that I’m a chronic editor. I have to fight my tendency to rewrite before I get the ideas down fully. Diane Capri: Morning Person? Or Night Person? How do you know? Roy: I’m a night person and Alicia is a morning person. Years ago when we lived in a studio apartment in NYC that could be a good thing. Now that we write together we need to take full advantage of the window period where we’re both awake and alert. Alicia:I have to sleep, but Roy has a lot of energy and is always a bit wired. Although neither of us is too keen on sitting forever, when Roy gets frustrated with a slow section he goes into Rappin’ Roy mode as seen in the picture. Don’t ask. Diane Capri: I am a total foodie and many Licensed to Thrill readers are, too. Tell us about your favorite restaurant. Why do you love it? Why would we love it? Roy: Nick & Toni’s in East Hampton, New York. Wood burning grill, scrumptious chicken and fish, and ORGANIC produce, mostly from the local farms. And just outside the door and down a picturesque stretch of winding country roads are the beautiful dunes of Long Island’s East End and the Atlantic Ocean. Nothing tops that. Fun interview! I can’t imagine writing with my husband, but then he’s not much of a reader. Hi, Jennette! Most authors ask us how our marriage has survived writing together! Thanks for coming by. It’s always interested me that some couples can work together and some can’t, Jennette. I’ve done several co-author projects and I generally enjoy them. But writing together seems like one of those projects that would lead to serious disagreements between spouses. It’s great to see that Alicia and Roy have managed it so well! Love these two. What characters themselves, let alone the people they create. The Rappin’ Roy Rocks! LOL!!! Great interview Diana…thanks for sharing! We love you, too, Natalie! I’d love to hear Rappin’ Roy, myself. C’mon Roy! Your groupies await!! Your books bring me back to my childhood on Long Island. Somehow you’ve really captured the feel of the place. I thought the island I knew was paved over by now, but maybe not. Thanks, Alicia and Roy! Oh, BTW, I like the characters and their predicaments, too! 🙂 You’ve created a unique series. Good luck with it! Thanks so much for your kind words, Sally! There are many beautiful places left on Long Island, and the east end of the North Fork is still mostly small rural towns and villages. We get a lot of Long Islanders here in Florida and in Michigan, Sally. They seem to enjoy traveling, too. And the restaurants are to die for, hmmmm? Great post! Love these guys!! Thanks for coming by, Pj! I couldn’t write with my husband, we like totally different genre’s lol. Kudos to you for making it work! Fun interview, Diane! Thanks, Melinda! Luckily Roy likes romantic comedy. But there are definitely some areas of romance that push his male buttons too far. Love the photo of Rappin’ Roy! Ha! Kinda hard to write with him in the room, I bet! Hi, Tamara! Yeah, the office is my quiet space and Roy uses another Mac on the dining room table. He likes to be in the middle of everything, even likes the TV on, and sometimes cooks while he writes. OMG! All that noise!! I need total quiet when I write. Good that Rappin’ Roy writes with Alicia! 🙂 Thanks, Tamara! What a fun concept for a series! I once worked with my husband, delivering newspapers on a 70-mile paper route each morning…that was enough. *s* Glad y’all make it work so well. Whoa, Amy ! Delivering newspapers on a 70 mile route? No wonder things got tense. Great to hear from you. OMG! 70 miles? Every day? Yikes! Thanks for stopping by, Amy! Dancing is so popular these days that you’re really smart to do a series on this concept especially with your backgrounds. I’m a night person and my hubby is a morning person. I don’t think we could ever work together but we play a great game of bridge so maybe…. Ah no, I don’t think so. Much success. 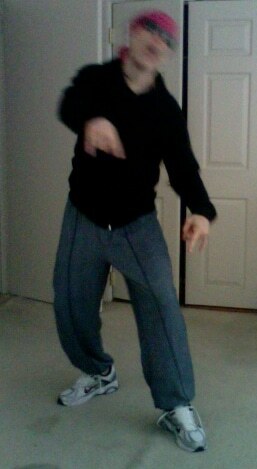 I so wish I could dance…..
Hi, Rhonda. Sorry, but the Rapid Roy video is too explicit for your tender eyes. Hi, Sheila. Always great to hear from you. We’ll get busy on those videos. Hollywood next. Good job, Sheila! Now we’ll get to see ’em for ourselves! I’m lucky if I can get my husband to read my books! He’s not much of a fiction reader. Great interview, guys! I’m going to check out your books since I like both dancing and Long Island. Keep on rapping, Roy! Hi, Kassandra. Thanks for coming by. Always great to hear from another dance and Long Island fan. Now, I gotta do some more rappin. I can barely get my guy to read my work… it’s so great that you two write together!!! Fun interview!! Thanks so much for coming by, Tiffany! I’m LATE to this paaaarty! The photo of rappin Roy made me laugh. H reads adventure and ‘real life’ fiction. He also does the technical stuff for me while I create and it works for us. He’s not a romantic but finds me funny – which is probably just as well. You guys are the best and I’ve enjoyed all the books in this series. The characters are truly memorable and you nail the dance routines and angst that all creative personalities deal with. Thanks, CC, and you are NEVER late!! Always good to see your smiling face. Thanks for the great comment! fun interview, folks. I loved book 1 in the series. and am looking forward to the following ones. Somehow I missed this post, and I’m so glad I went back in the Reveals to make sure I’d read them all. This is a fascinating Reveal, Diane. What an amazing couple, Alicia and Roy. Wow, talk about talent! You two rock!